Screams. Two hats on the river bank. Ellen had lived happily together with her husband William Brass, a shoemaker, for 14 years. Together they had seven children though tragically three had died young, one that very day. Everything seemed normal – well as normal as they might be after the loss of a child. That evening William gave Ellen money to cover the weekly payment to the Royal Liver Society which was for the burial of the children. Together she and the youngest boys went off to pay the bill and visit family on the way. They chatted to Maria Blackwell, Ellen’s “mother-in-law”, in Kingsmead-street. Apparently Maria was not well and so they continued on their way. Later William found just his two oldest children at home but initially was not surprised. He visited Ellen’s father to get news and then afterwards friend’s houses. Nothing. While the cultured folk of Bath were listening to a piano recital, a tragedy was unfolding at the end of Dog-lane. Ellen, with Henry tied to her by a cord and John in her arms, walked into the Avon. In his frantic search, William eventually enquired whether anyone had passed down Dog-lane with two children. The answer led him to the river. Two little hats on the bank – at once recognised as belonging to his children. He ran away. He could not stay to witness any more. Jury’s verdict. “Ellen Brass, while in a state of insanity, destroyed herself and … likewise destroyed her child, Henry Brass.” John’s fate not known. 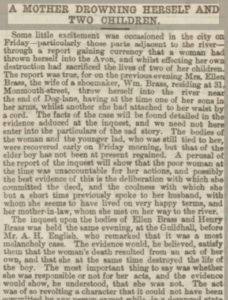 Bath Chronicle and Weekly Gazette 21 November 1867, page 3, www.findmypast.co.uk, accessed 19 January 2016. Versions of the murder / suicide and reports of the inquest appeared in at least 43 articles in papers for counties across the length and breadth of England. Always search for articles more widely than just the local newspaper. Editors were always looking for news – particularly if it was as sensational as in this case. Sensation and tragedy sold newspapers then just as they do now.